Clean, modern lines and eco design define the YiAhn bassinet– but this early life sanctuary is designed for functionality well beyond baby’s first three months. 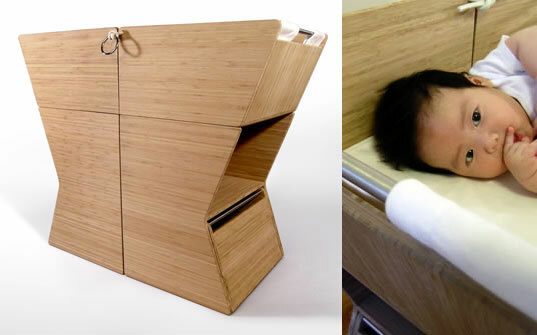 Rather than buying into the high-priced, short-lived bassinets he found on the market, Brooklyn-based industrial designer Chul Min Kang was inspired by the approaching arrival of his first child to create newborn furniture that honors healthy growth and extended functionality. The bassinet turns from baby bed to toy bin and bookshelf to chair and table- meeting your little one’s furniture needs all the way through elementary school. Crafted from renewable, low-toxic materials the YiAhn evolves from bassinet to storage to a creative space, nurturing children from their first day to their first double-digit birthday. 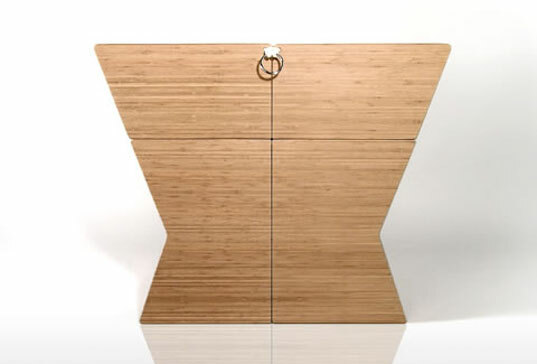 Composed of Plyboo® bamboo plywood, stainless steel, chrome metal and 100% cotton sheets the YiAhn uses a simple rope tie system to fasten the modular components together. Behind the gorgeous materials and sleek aesthetic is an ingenious combination of furniture creations that ensures a purposeful place in the home. When baby outgrows the bassinet it can be easily converted into a toy bin and bookshelf with drawers. As grade school approaches, the modular system can be transformed once again into a comfortable chair and table, appropriate for children 4 to 8 years old. And, if the stork should happen to pay another visit, the components are easily reconfigured back into the original bassinet form. Chul Min Kang calls his baby’s first furniture “a design love story” and we’re equally enchanted – both with the thoughtful design and his beautiful son, YiAhn (pictured above). How much does the basinette cost? RE: My Baby’s First Furniture: YiAhn Dimensions: 31″ H x 39″ W x 17″ D How much is this product? I could not get to a link anywhere with prices. However, there IS one other big drawback to such great eco-friendly products...the millions of parents who could really use such a multifunctional item are of mostly low-icome status and could never afford them. We live in a National forest and so are VERY eco-aware...in spite of the region's historically high poverty rates. Thank you! This is a really FANTASTIC idea!!! I will get this for my newborn baby.... It would be great to see him playing with bassinet he is growing with... I LOVE THIS!!! perfect idea. this is something we should do for every piece of furniture designed. its about more than a couple months, but the life cycle of a product. definitely consider how you can use it for even after 4 yrs. i love it. beautiful... how do we find out how much it costs?! This is a great idea, It would be really cool if it could change one more time into something an adult could use, that way you could have this piece from birth until death. Then pass it on to another generation... there would be so much more meaning and story behind the furniture. simply & lovely eco !! This is an awesome idea. Even if kids are in the very, very distant future, I'd love to have this type of convertible furniture in my place --- the wood grain is really eye-catching. Another great product feature, as always. Clean, modern lines and eco design define the YiAhn bassinet- but this early life sanctuary is designed for functionality well beyond baby’s first three months. Rather than buying into the high-priced, short-lived bassinets he found on the market, Brooklyn-based industrial designer Chul Min Kang was inspired by the approaching arrival of his first child to create newborn furniture that honors healthy growth and extended functionality. The bassinet turns from baby bed to toy bin and bookshelf to chair and table- meeting your little one's furniture needs all the way through elementary school.